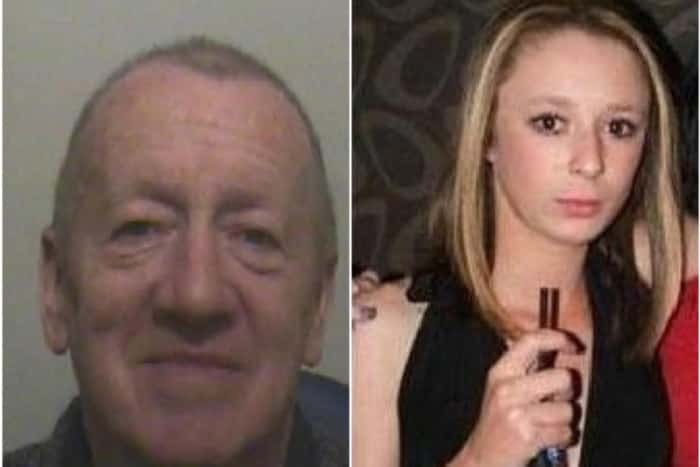 The man who groomed and murdered Blackpool girl Paige Chivers has been given a further jail term for subjecting two young children to a catalogue of vile physical and sexual abuse more than a decade before killing the vulnerable teen. Robert Ewing, 66, was jailed for life in 2015 for the 2007 murder of 15-year-old Paige, whom he had exploited sexually. It has since emerged that he terrorised a young girl and boy in the early 1990s, with one of the children as young as five. 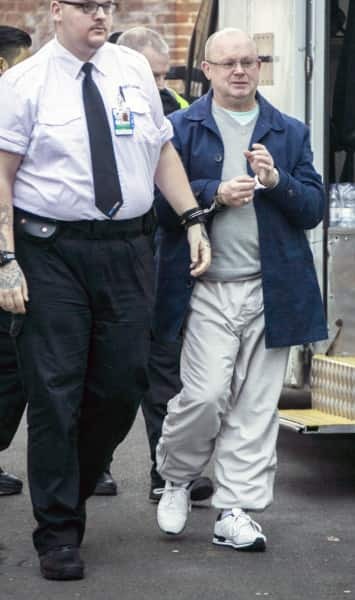 He was given 15 years in jail after being found guilty of the latest offences at Preston Crown Court – but the court heard due to his ongoing 32-year sentence he is not eligible for parole until he is aged 92. Judge Philip Parry said Ewing could appear “charming and beguiling” to other adults. But he told the killer: “Behind closed doors with children you were a brutal, perverted and sadistic bully. He said Ewing made the girl’s life “an utter misery” while treating the boy “like a play thing”. The court heard he subjected the little boy to physical abuse by tying him up, throwing urine at him, defecating on his bed, throwing him around, dragging him by his hair and hitting him with a back scratcher. He was found guilty of two counts of indecently assaulting the boy, and a count of child cruelty towards each of the children. Some jurors were visibly distressed as they were then told he was responsible for Paige’s murder and other offences. Ewing, wearing a bottle green jumper, sat with his arms folded gave no reaction as the girl, now a grown woman, stood in the witness box to tell the court how his depraved behaviour affected her. She said: “He tried to rid me of my pride, my dignity, and my identity. The boy, in a statement, said: “I really believed when he made threats to kill me I thought he would do it. The court previously heard how the child killer forced the girl to watch while he tortured the boy, who was just seven or eight-years-old at the time. He would subject her to cold baths and would force her head under the water until she couldn’t breathe. The girl, who was aged as young as nine, was frequently woken at night and made to crawl around and pick up fluff from the carpet. The boy was also made to stand naked on a chair while Ewing watched him, and he would sexually assault him. The court heard the boy’s headmaster raised concerns about rope burns on the boy’s wrists – caused by Ewing – but he was “too scared to tell the truth” and blamed them on another child. 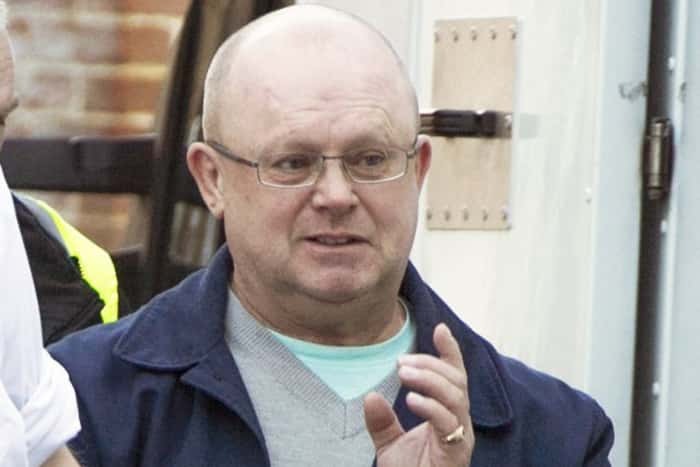 A later police investigation saw Ewing convicted of two counts of gross indecency and one count of indecent assault at Wolverhampton Crown Court in 1995. In 2007, Ewing, formerly of Kincraig Place, Bispham, was convicted of murdering Paige Chivers, who was last seen on August 23, 2007, at a bus stop in Ashfield Road, Bispham. The 15-year-old’s body has never been found but Ewing was convicted of killing her in his flat after bloodstains were found. During a search of Ewing’s flat in All Hallows Road, Bispham, police officers found a hoard of cuttings about the case and about the murder. 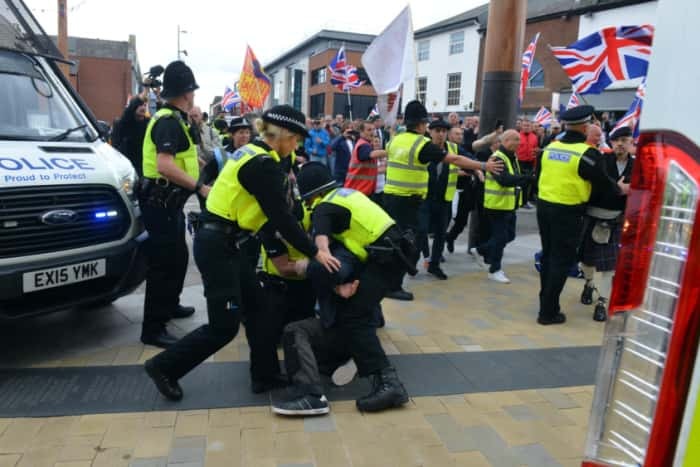 A protester used his head as a weapon to charge at and injure a policeman battling to keep rivals apart during a mass demonstration in Sunderland city centre, a court heard. Thomas Allen, 58, has been fined and ordered to pay the officer compensation by magistrates who scolded him for his actions. They were told the unprovoked attack caused the PC to tumble to the ground, causing grazing to an arm. Despite the assault, he was able to keep hold of Allen, of Hartside Road, Pennywell, Sunderland, who was arrested. Even Allen’s defence solicitor admitted his client was still “hyped up” when later questioned at a police station. Sentencing Allen, who is believed to be jobless, magistrates in South Tyneside criticised him for being part of trouble which led to three arrests on the day. They said police had better things to do than wrestle with a man of his age during what should have been an entirely peaceful protest. The court heard Allen was part of two marches organised by left and right wing groups which descended on the city on Saturday, September 15. 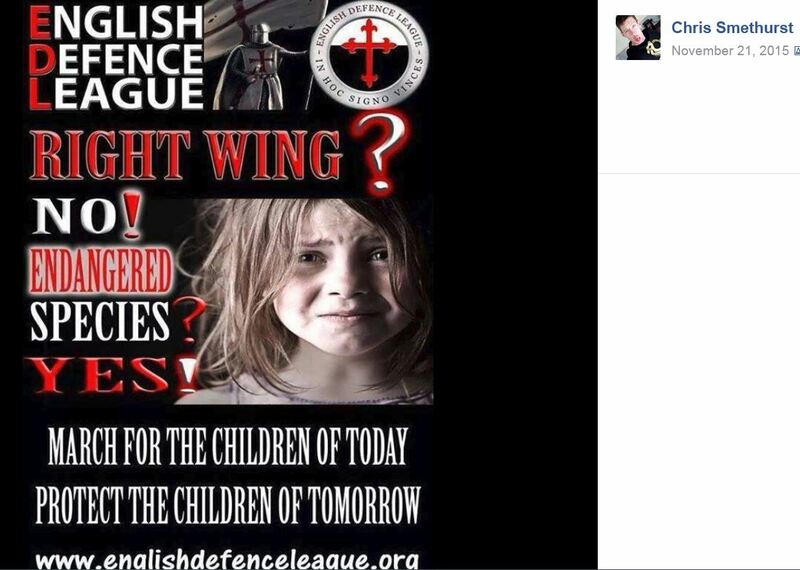 One was by Wearside-based Justice for the Women and Children Group, which was joined by the Democratic Football Lads Alliance (DFLA). 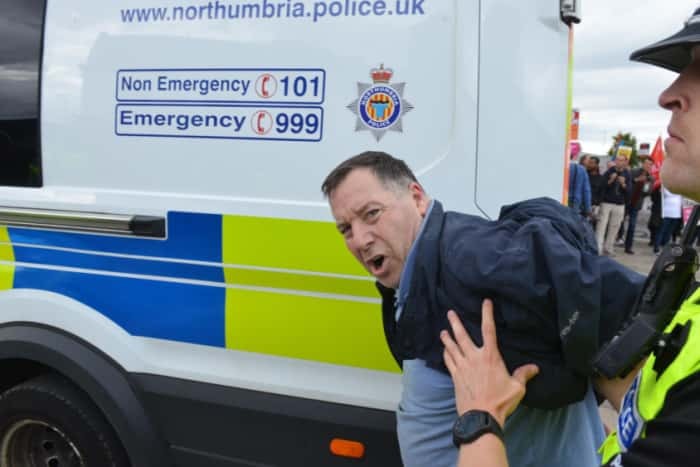 A counter demonstration was held by Sunderland Unites and Stand Up To Racism North East, which included members of trade unions, political parties and politicians. Trouble flared close to Keel Square when members of the DFLA ignored march stewards and tried to break through the police lines which separated them from the other group. Prosecutor Lesley Burgess said: “The officer was in uniform and part of an incident ongoing in Sunderland city centre. “He was keeping the peace between left and right wing activists. As part of the cordon, he was directing members of the protest. “He instructed Mr Allen to continue on his way and in the direction of where the demonstration was a heading. “Mr Allen took no notice. He ducked his head and charged at the officer into his stomach. “The officer says that he had no regard for him and forced him to fall backwards, and they were both forced to the floor together. Harry Burn, defending, described Allen, who admitted one charge of assault when he appeared in court, as “hyped up” even after his arrest. He said his client had denied the offence when interviewed, but admitted he might have pushed the policeman. Mr Burn said: “It was not nice for the police officer. But the injury is what it is, it’s a graze to an arm. “It’s not too serious. He hasn’t needed medical support, but it was his job and he didn’t need that to happen. Magistrates fined Allen £80 – reduced from £120 due to his guilty plea – and ordered him to pay £100 compensation to the officer. He must also pay a £30 victim surcharge and £85 court costs, with the entire amount being paid at £10 a week. A violent thug high on a cocktail of cocaine, ecstasy, cannabis and whisky repeatedly knifed a taxi driver in a random attack after finding out his girlfriend had ‘slept with his neighbour’. 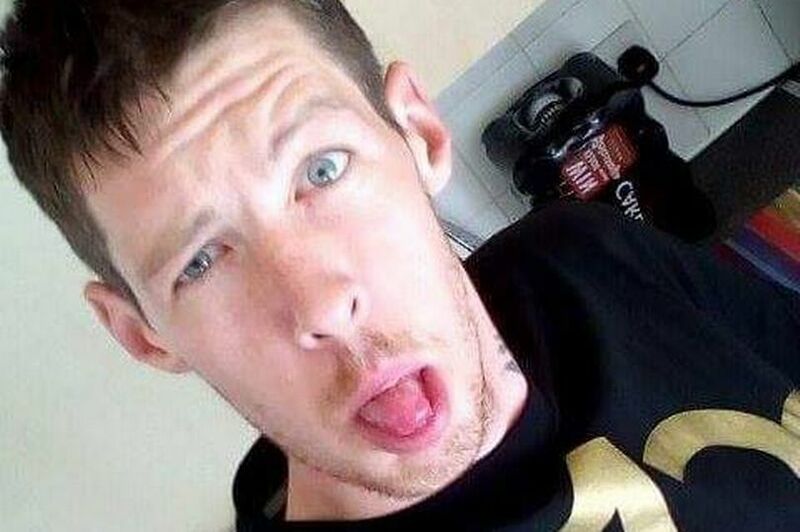 Christopher Smethurst, 32, screamed ‘die, die, die’ as he stabbed his victim in the face and body after he had been taken to an address in Moss Side. The career criminal claimed he was upset as he had just found out his girlfriend had slept with his neighbour. But a judge slammed the ‘vicious, frenzied and entirely unprovoked attack’ and jailed Smethhurst for 19 years and four months. His victim, a 42-year-old driver working for Street Cars, had picked him up from outside Chico’s takeaway in Longsight and had appeared to be chatty and friendly during the journey to an address in Ruskin Avenue in Moss Side on November 11 last year. 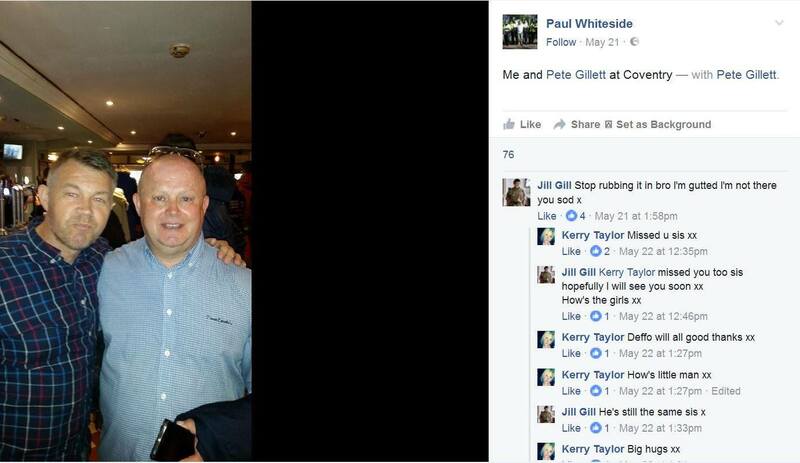 The private hire driver told him the fare of £5.20, but there was no reply and when he turned around Smethurst lunged at him with a kitchen knife – which was five or six inches long – prosecutor David Temkin told Manchester’s Minshull Street Crown Court. Smethurst shouted ‘die, die, die’ as he repeatedly stabbed his victim in the neck. The taxi driver tried in vain to wrestle the knife from his attacker, suffering more stab wounds to his hands, before Smethurst pulled at the driver’s seat-belt, pinning him against the back rest, and continued to knife his victim in the face. The driver, who was bleeding heavily, managed to escape, but Smethurst got out and continued the sickening attack in the street. The desperate cabbie ran barefoot down the street – after his shoes came off during the assault – knocking on doors and begging for help. Eventually, one resident took him in and dialled 999 as Smethurst. Police found blood all over the inside and on the outside of the car. The victim was taken to Manchester Royal Infirmary where he was treated for ten serious stab wounds to his hands, arms, chest and head. He was left with a fractured eye-socket and needed plastic surgery to repair the stab wounds and damage to nerves and tendons. “I thought I was going to be killed,” the driver later told the police, describing how the attack had caused significant psychological and physical damage. Smethurst was arrested ten days later in Crewe where he had intended to rob shop with a toy gun he had spray-painted black. His DNA was found in a bag which he had left at the takeaway in Longsight which, together with CCTV and evidence from the driver, linked him to the assault. Smethurst was said to have a series of criminal convictions, including one for battery. Jonathan Turner, defending, said his client had expressed ‘genuine remorse’ in letters he had sent both to the judge and his victim. The barrister said his client ‘had no idea’ why he had launched the attack, but said it had followed an argument he had had with his girlfriend, in which he discovered she had ‘slept with a neighbour’. The defendant had consumed ‘a large quantity of drink and drugs’ and had ‘simply lost his mind’, said Mr Turner. “He knows that is absolutely no excuse for the way he behaved that day,” he added. Judge John Potter told Smethurst he was considered so dangerous he must serve a minimum two-thirds of the 19 years and four months jail sentence. Smethurst, of no fixed abode, but originally from Crewe, pleaded guilty to wounding with intent to cause grievous bodily harm with intent and possessing an imitation firearm. 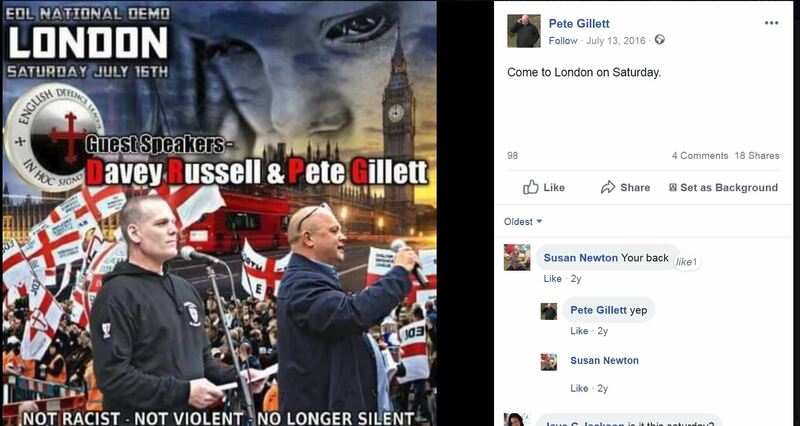 A Torquay man who once plotted a nationwide hate campaign could be sent back to prison after being found with a prohibited weapon. Tobias Ruth, 23, has become obsessed with knives and weapons, Exeter Crown Court was told. He admitted two weapon-related offences when he appeared at the court for a short hearing. The court was told he had adapted a fly swat into a stun gun and had a .22 air rifle. Mr Kevin Hopper, defending, said Ruth had become ‘somewhat obsessed’ with collecting knives and weapon paraphernalia. But he said the weapons had not been used in any crime and the electric fly swat did not work. The defendant, formerly of Walnut Road but appearing via video link from custody, pleaded guilty to possessing a prohibited weapon on August 7 and possessing a firearm when prohibited. Judge David Evans said he wanted Ruth to speak to the probation service before sentencing him. He said all options, including immediate imprisonment, would be considered. He adjourned sentence to October 25. 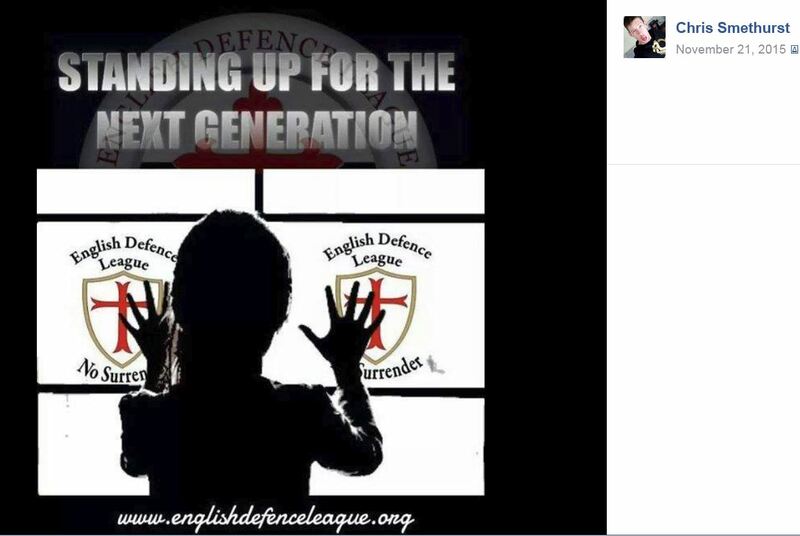 Ruth was just 18 when he and a friend carried out a campaign of racist vandalism in Torquay in 2012. 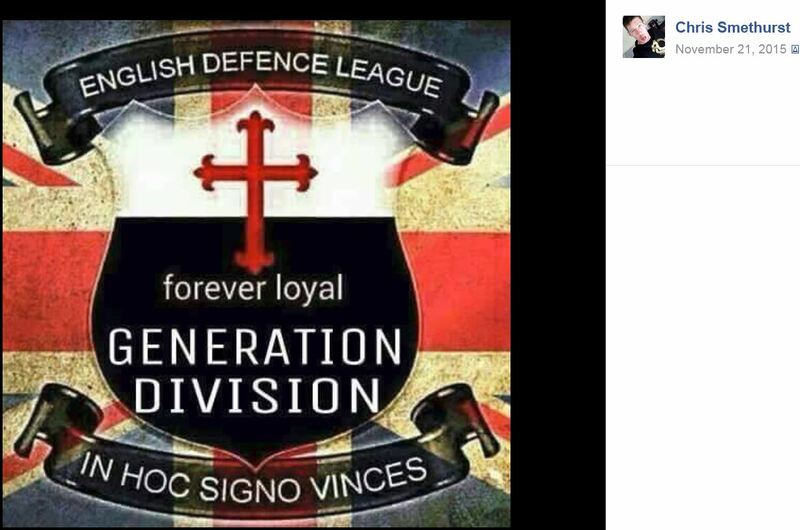 They styled themselves as Knights Templar and studied the crimes of Norweigian mass murderer Anders Breivik. Their arrest led to houses being evacuated and roads cordoned off. Ruth admitted conspiracy to send malicious messages and conspiracy to cause criminal damage. He was jailed for 33 months. The judge at the time said the communications were intended to cause the fear of racial violence and plainly had a racial element.